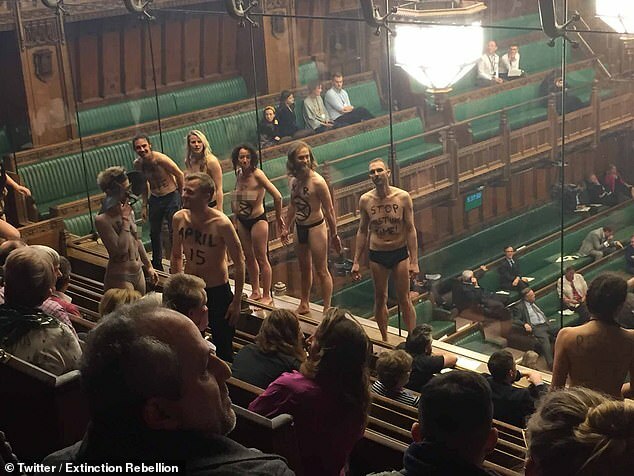 Semi-naked climate change protesters interrupted a Commons debate on Brexit tonight as they stripped off in the public gallery. Several of the 'Extinction Rebellion' group glued themselves to the window dividing MPs from the watching public in the biggest Commons security breach since 2014. Labour MP Peter Kyle joked about the 'naked truth' as MPs' attention was distracted from his speech by the demonstration. Tory MP James Heappey defied Commons rules to photograph the dozen people, who had slogans including 'climate justice act now' and 'eco collapse' daubed on their backs. Speaker John Bercow told MPs to ignore the demonstration and continue with the debate as they stood in a line with their backsides pressed against the security glass. Most were wearing only thong-style underwear which left little to the imagination. Shocked MPs including former Labour leader Ed Miliband glanced up at the group as they stripped off behind the glass screen that separate the chamber from the public gallery. Some of the protesters were singing Nelly the Elephant while under the gaze of Parliamentarians. Savannah, an English literature student from Ladbroke Grove in west London, was one of the naked protesters. She said: 'A bunch of people glued themselves to the window in the public gallery. 'Everyone stripped and two people were elephants and had climate crisis written on them. Police officers removed the demonstration, which failed to halt debate on the floor of the Commons, after around 30 minutes, using an unidentified liquid to free their hands. Several of them refused to walk out with police and had to be carried out from the gallery. All other members of the public who turned out to watch the debate were also asked to leave. Extinction Revolution promises 'non-violent direct action and civil disobedience' to make their point on climate change. It is the most significant breach of security in the public gallery since a man hurled a bag of marbles at the glass screen in October 2014. The screen was erected to separate MPs from the public after Tony Blair was pelted with purple powder during PMQs in 2004.